This simple technique of cooking juicy fruits and sugar until the moisture evaporates and the mixture is thick enough to solidify in a mold has been used in India for thousands of years. Phal ka halava is a delicacy you can make in large quantities. Under refrigeration, it keeps several days. Children love to eat fruit halva. You can also make fruit halava from ripe pears, mangos, and other juicy fruits. Heat the butter in a saucepan and fry the apples for 4 to 5 minutes, stirring often. When they are soft and browned, add 2 tablespoons of water, lower the heat, and cook uncovered for 15 minutes, until the apples merge and thicken. Break up the lumps of apples with a spoon and stir often to prevent scorching. Add the sugar. Continue cooking and stirring until the mixture begins to form one mass and pull away from the bottom of the pot. Raise the heat to medium, and stir continuously to increase the evaporation. When it becomes difficult to move the spoon and the mixture becomes translucent around the edges, remove the pan from the heat. Stir in the raisins and nuts. Cook 2 more minutes; then remove from the heat. Turn the halava onto a plate, and form it into a flat cake 1 inch (2.5 centimeters) thick. When it's cool, cut it into squares. 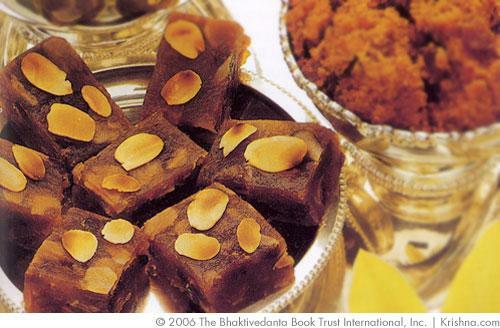 You can find this recipe and more in The Hare Krishna Book of Vegetarian Cooking. Submitted by Anonymous on Thu, 03/15/2012 - 02:49. Thank you for sharing these wonderful recipes. The daughters are so excited to see these. Cant wait to try these out.